Welcome to Sparrow's Nest! Large beamed ceilings greet you. An abundance of counter space to prepare a meal. 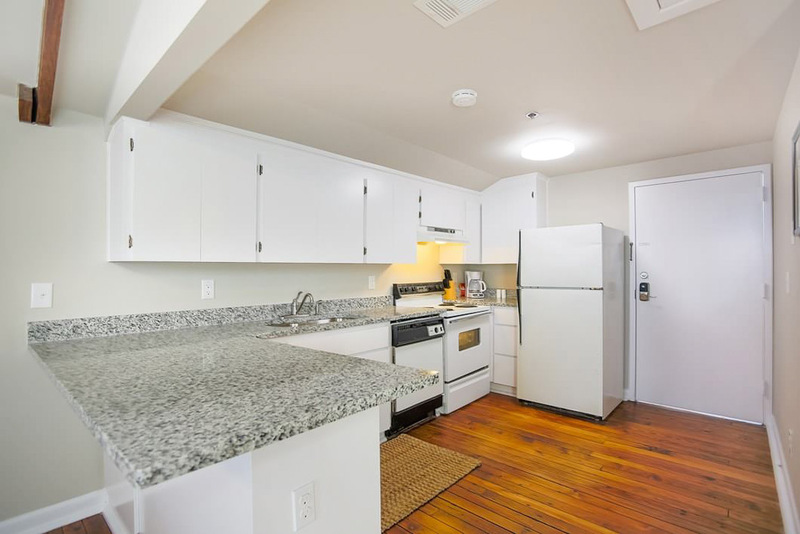 This kitchen has all the amenities of being in your own kitchen. The front door to get in. Breakfast nook to talk to each other during morning coffee. View out into the rest of the home. 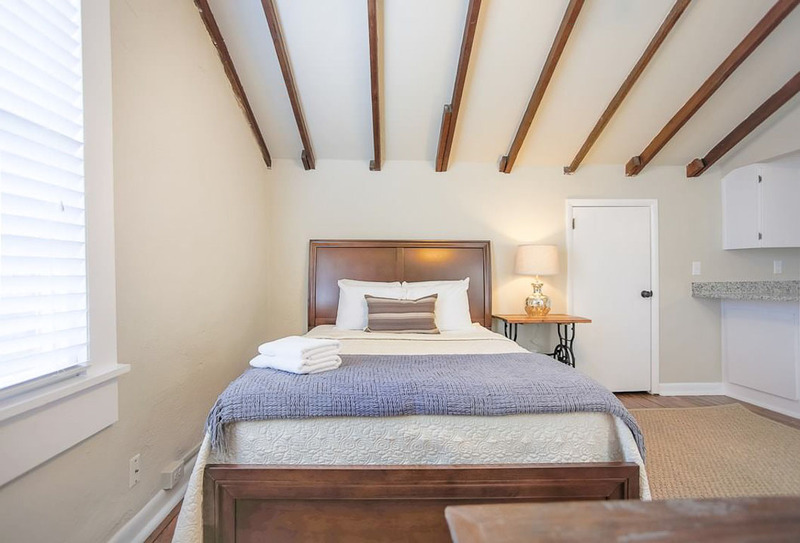 The skylight above the bedroom brings in lots of natural light. View from the bathroom. Cozy, bright and cute. Open floor area great for small toddlers with a pack n' play. Come perch yourself inside the Sparrow's Nest. The updated flat screen television is superb to watch sporting events on. Fresh linens and a cozy blanket just for you! 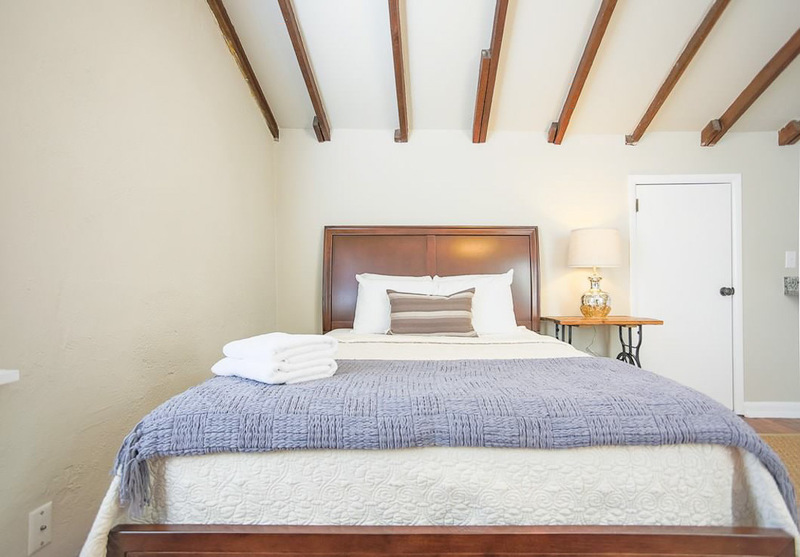 The fluffy king bed awaits you. Stand up shower and large mirror. The bathroom is located right off of the living area. Minutes away from Savannah's best shopping and dining destinations. Sparrow's Nest is located right in the heart of downtown. 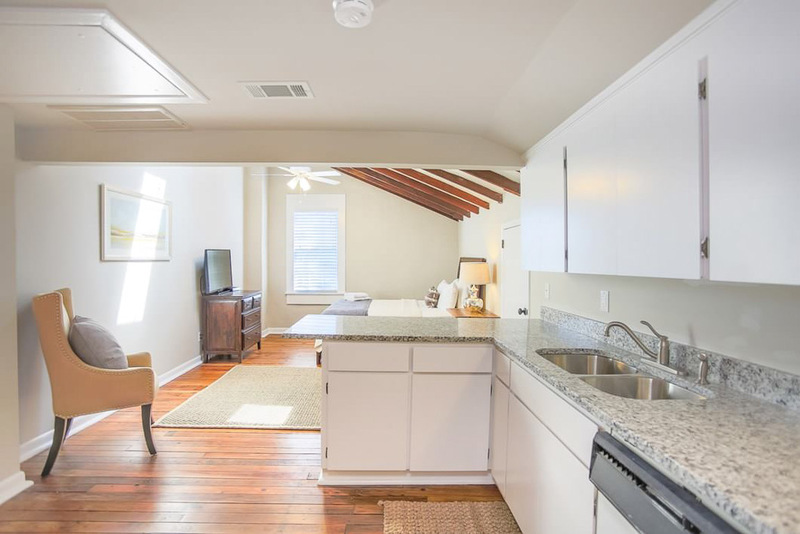 Ideally located on Liberty Street, Sparrow’s Nest is within walking distance to everything Savannah has to offer. This fourth floor walkup isn't for those with mobility issues, but the rooftop views are worth the extra effort. 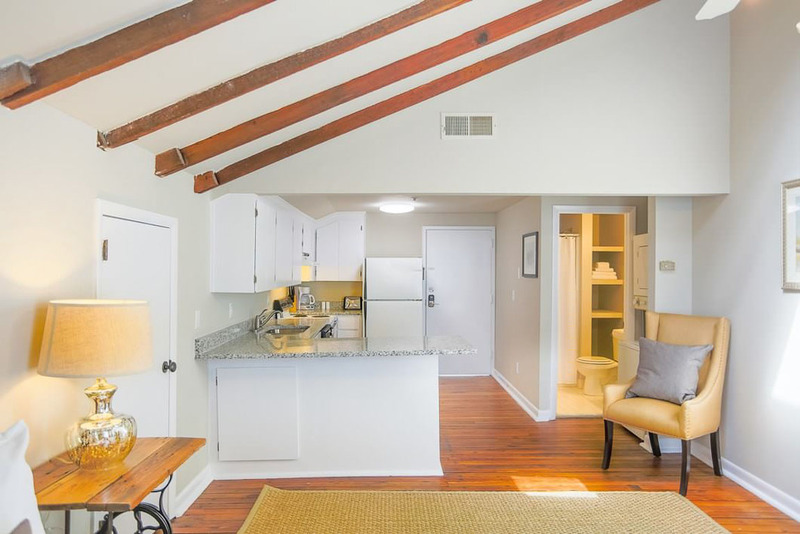 Sparrow’s Nest has a high, slanted ceiling with exposed beams and a skylight letting in plenty of natural light. The full kitchen has everything you’ll need to make a meal for two, and the counter bar has seating, making it a great spot for a morning cup of coffee before starting your day. The stacked washer and dryer makes longer stays convenient, and the large screen TV and comfortable Queen sized bed means you’ll never have to worry about rainy days. 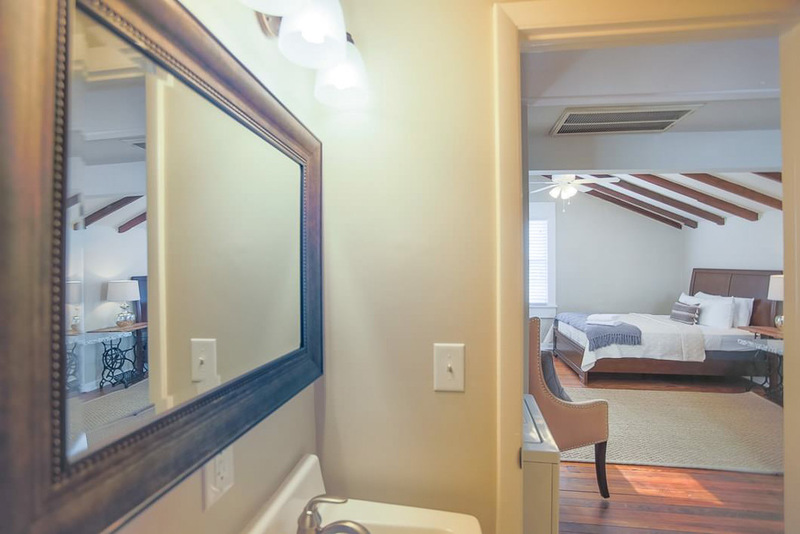 This apartment also has a huge walk-in closet, and a full bath with standing shower. You’ll be staying right next to J. Christopher’s, one of our favorite brunch spots! You’ll be able to see the Cathedral of St. John the Baptist, which underwent a major restoration to preserve their beautiful stained glass windows and architectural integrity, as soon as you step outside. Spend an afternoon wandering through Colonial Park Cemetery, the final resting place of many of Savannah’s earliest residents. 2) Parker’s Gourmet Market is just around the corner and open 24hrs. The space is nice and accomadating and convienently located to every where we wanted to go. The restuarant downstairs was really good. My only compliant is that the final flight of stairs to get the apartment are steep. We visited Savannah for a wedding and there were a lot of outfit changes that needed to happen for various events. We came to dread the stairs. Overall, the place was clean and the bed was comfy. Apartment was very clean, wifi worked fine, bed very comfortable. Could use better lighting over breakfast bar, and in closet. Shower extremely small. I really enjoyed the coziness of this place. It was me, my husband and our little dog. The size is perfect. All the amenities function perfectly with the exception of the internet. If you need to work on your laptop, which we both do, you cannot stay here. If you do not need internet access, it's perfect for the price. Over all the place was great, very clean and comfortable! Only issue was the stairs, my fault, I didn't realized I booked the fourth floor, lots of extra exercise. Perfect location, could walk anywhere in a short amount of time. My suggestions would be to invest in some better pillows, bed was comfy, pillows not so much. The shower was small, don't recommend larger people rent this room. I'm 5'4" and had barely enough room. Just a suggestion, nothing wrong with it, it was just small. Otherwise we had a great time, didn't want to leave. Great location in historic Savannah! I had a conference at the Hilton down the street and this was the perfect location. It was right in the heart of the historic district and very close to many great shops and restaurants. It was also a fairly easy walk up to the river and City Market. The room was super cute and comfortable, and the price was great. The only thing I would caution is be prepared for the walk up 3 flights! Would definitely recommend. Perfect location, walkable to all sights, lovely perch! This airy studio was just as described, with sparse but nice furnishings, comfy bed, and a modern kitchen. 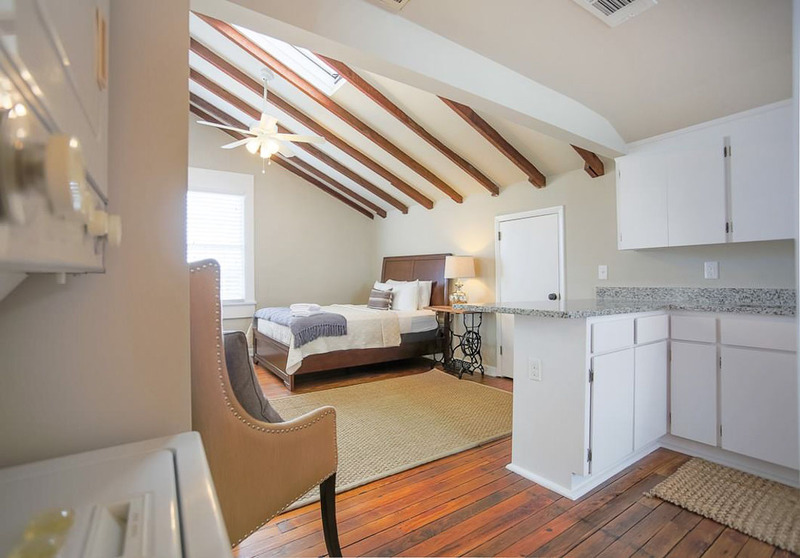 The location is ideal; walkable to various historic houses and squares, the river, SCAD, etc. ; no car was necessary to get around town from here. The check-in process was very easy with the app and the rep I spoke to on the phone to arrange early check-in was courteous and helpful. My one quibble is the shower is on the small side and does not appear to have been updated with the rest of the appliances (though it was perfectly clean); also, the hairdryer was broken. Great for a weekend getaway or a longer stay with the functional kitchen with dishwasher, full-size fridge. 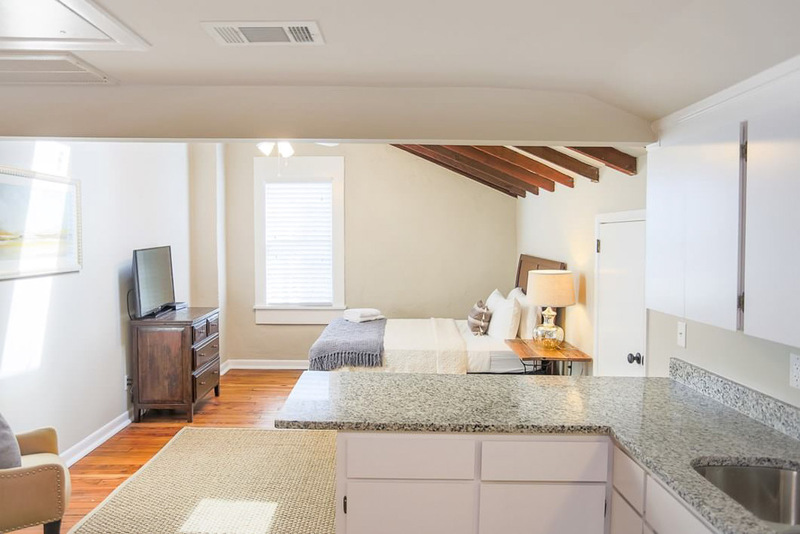 Sparrow’s nest is a spotless, professionally decorated, cozy space ten/15 minutes from restaurants and attractions in Savannah’s historic district. The apartment was super clean with all the necessary amenities. The Lucky Savannah staff provided excellent recommendations and tips to make our stay enjoyable and stress free. The only concern was the mysterious discovery when we returned from a four- hour outing only to find the apartment door cracked opened. Although nothing appears to have been out of place or missing from the apartment, the experience was indeed unsettling. Catherine, thank you for choosing Lucky Savannah! We're so happy to hear that you enjoyed the location and that our staff was helpful. We look forward to hosting you again soon! First, let me say that this apt is in the ideal locale. As a New Yorker I need to be able to walk to everything and from this location I definitely could. All the best restaurants, bars, the river; everywhere I wanted to see and be was within a 15 min walk. In that same vein, though, it is a 4 floor walk up. As a NY'er I am used to it, but it may be a lot for others. Lucky Savannah couldn't have been nicer to work with, but to be honest this apt needs some major TLC. For a short term stay, like a long weekend, I would call it a pretty good find. However, I have been in it for 4 months, and ended up putting a fair amount of my own money into adding things to make it more amenable to a long term stay; Some as simple as a cover for the trash can so my apt didn't smell like garbage, but others as major as two mattress pads because the mattress was so hard. 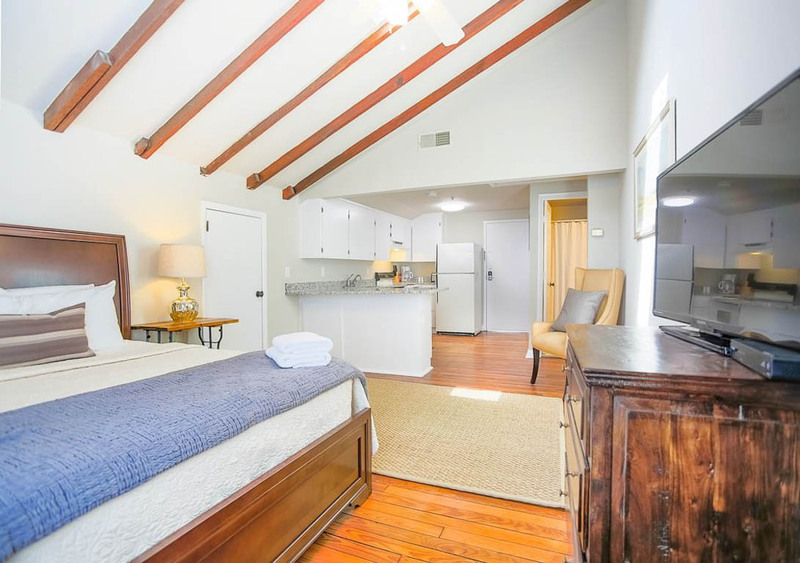 This review was hard to write because as I said, Lucky Savannah and their staff have been lovely, but for what this apt costs per night it truly needs some improvements. We so enjoyed our stay at the Sparrow's Nest. It had everything we needed, and it was so easy to get around Savannah from here. It was clean and well-kept with a touch of Savannah charm. Make sure you're fine with climbing stairs and small showers before booking (fine with us, but I can see it being a challenge for others). Also, wonderful communication by owners before and throughout visit. No questions went unanswered. Thank you for making our stay in Savannah so convenient and cozy. Hi Jackie! Thank you for choosing Lucky Savannah! 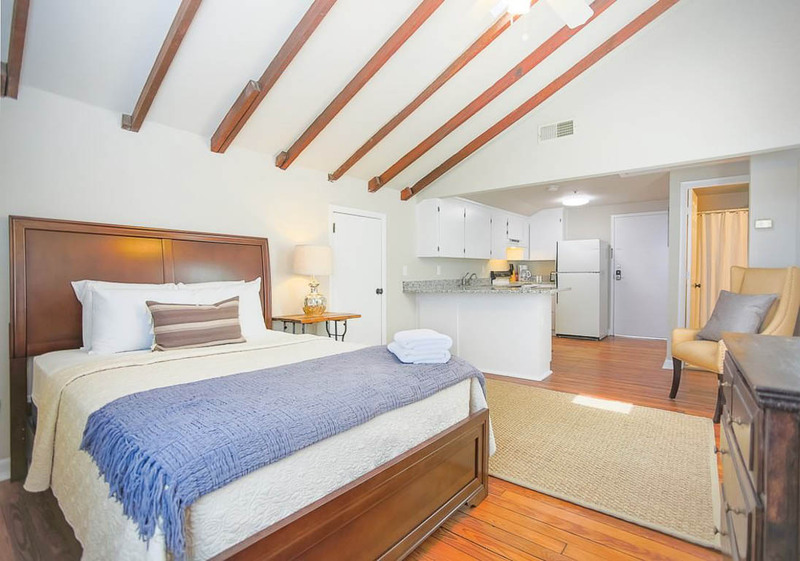 We are so excited that you enjoyed the cleanliness, available amenities, and location of the property. We hope to see you again soon! Our rental, The Sparrows Nest, was in the perfect location for us. Located right in the middle of the historic district, it’s a quick walk to the eateries or shops. We were on the fourth floor, so we didn’t hear any noise from traffic or pedestrians, which was great! 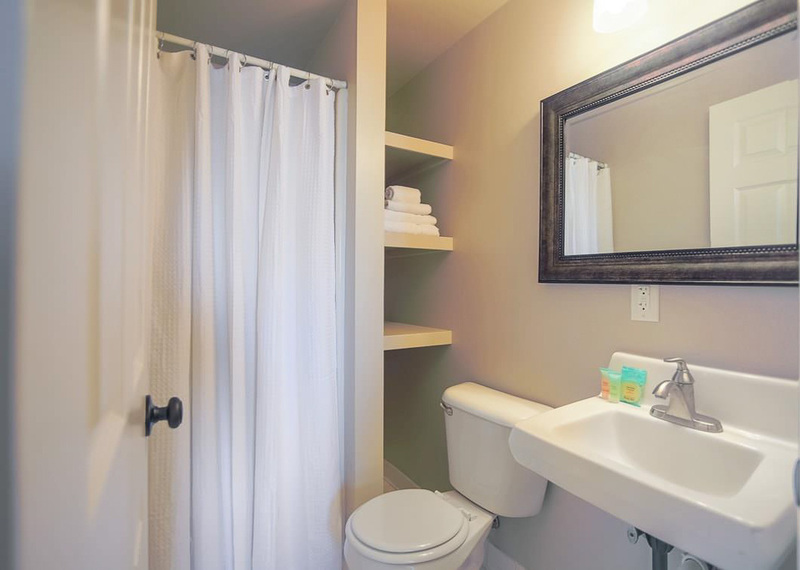 Lucky Savannah does a great job with the decor and cleanliness of their rentals. We only had one drawback: the shower. It’s a bit on the small side, which caused a problem for my 6’2” husband. Savannah is a beautiful city and staying in this nice apartment made the experience even better.Thank you. Overall it was very good. The place was cute and clean. We LOVED the Sparrows Nest!! The studio flat was super clean, romantic and a great location. We loved being able to walk back to the flat & drop our packages & freshen up then heading out again to Savannah's Historic District. The shower is small, but you're not visiting Savannah GA for the shower experience... We would most definitely stay here again. The condo was cozy, clean, and in a good location. Perfect for a romantic trip for two. My sister and I came into Savannah for a long weekend. The location of the Sparrow's Nest was absolutely perfect—central to all the gorgeous sights Savannah has to offer. The apartment was set up beautifully and had plenty of space for the 2 of us to be comfortable. The bathroom was small (downside for 2 girls needing the mirror), but otherwise an absolutely perfect stay. Lucky Savannah made it so easy to check in and out and do everything throughout our stay! We've already recommended this to lots of family and friends! Can't wait to come back! Hi Alessandra! Thank you so much again for choosing to stay with us. We're so glad to hear you enjoyed Sparrow's Nest and our beautiful city. We pride ourselves on being a service beyond just a vacation rental company and are glad to hear that our staff was helpful and prompt. Please know that you're privy to our Friends and Family discount next time you stay with us. Looking forward to hosting you again soon! It was located right in the middle of downtown we could walk right to everywhere we wanted to go. We went and ate at the Treylor Park and the food was absolutely amazing. The apartment itself was nice, it was on the fourth floor, pretty quiet and was very accessible. Hi Hayden! Thank you so much again for choosing to stay with us. We're so glad to hear you enjoyed Sparrow's Nest and the local food scene. Please know that you're privy to our Friends and Family discount next time you stay with us. Looking forward to hosting you again soon! My Sis and I stayed at the Lucky Savannah Dec2-5. It was very clean, a pleasant first impression. The location is perfect. I didn't have to drive till departure day. I agree with others about the small shower, but we found humor in it, it did it's job. Also, the owner/manager was outstanding during our stay, especially when I realized I had us checking out a day early. Thank you Brooke. Hi Lisa! Thank you so much again for choosing to stay with us. We're so glad to hear you enjoyed Sparrow's Nest and that our staff was helpful and prompt. Please know that you're privy to our Friends and Family discount next time you stay with us. Looking forward to hosting you again soon! Hey Beth! Thank you so much for being a wonderful return guest with Lucky. We're so happy to hear you enjoyed your time at Sparrow's Nest, and look forward to hosting you again soon. Hi Micah! Thanks for staying with us. We look forward to hosting you again soon! My husband and I stayed at the Sparrow's Nest for our Spring Getaway. Everything was perfect. The location was great and the studio room had everything we needed. We were able to watch a couple beautiful sunrises from our 4th floor window. We will be back to Savannah and Sparrow's Nest. Hi Debbie! Thank you for staying at Sparrow's Nest for your Spring Getaway. You really can't beat that view of the sunrise! Good location, parking was kind of a pain! Hey Hayley! Thank you for staying at Sparrow's Nest for your marathon trip. We look forward to hosting you in a home with provided parking next time you're in town. The only 2 setbacks were the parking ( you can get a parking pass to not have to feed the meter and it is very reasonably priced ) and that it was on the fourth floor. Those were the little things I did not plan for. The property and room were absolutely perfect, It matched the photos exactly. It was about a five minute walk to "down town" and they have a Breakfast restaurant right next door. What I thought stood out the most was the management staff. They always answered my calls and were able to assist with all my questions. I will stay here again next time I am in Savannah and would recommend this to my friends and family. Thank you for making my stay so enjoyable! Thank you for the kind words, Brad! We're so happy to hear that you enjoyed the property as well as our responsive staff. We look forward to hosting you again soon. This unit was perfect for our last minute weekend getaway! It is clean, cozy, and convenient and quiet. We arrived on a Friday, parked our car, and did not get back in the car until Sunday. 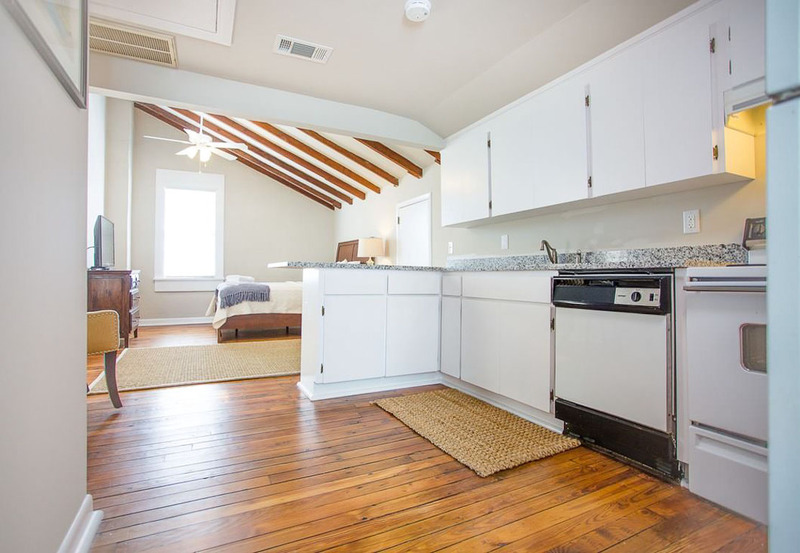 It is conveniently located within walking distance to all the sights in Savannah. The bed was comfortable and the kitchen was very nice. The only thing that would have made our stay better would have been a couple more towels and washcloths. However, we made our reservation late in the afternoon, a few hours before arrival. I'm sure it would have been different if we had given more notice or called and requested more. We were thankful that you were able to accommodate us on such short notice. The staff was friendly and helpful. Thank you for helping us have a memorable getaway! We appreciate it! Hi Amy! Thanks again for staying at Sparrow's Nest. We look forward to hosting you again soon! Thank you for staying at Sparrow's Nest, Jessica! We do appreciate your patience with the plumbing issue, and will be sure to make entry in the main building more clear in the guest portal. Please know you're privy to a Return Guest Discount next time you stay with us! 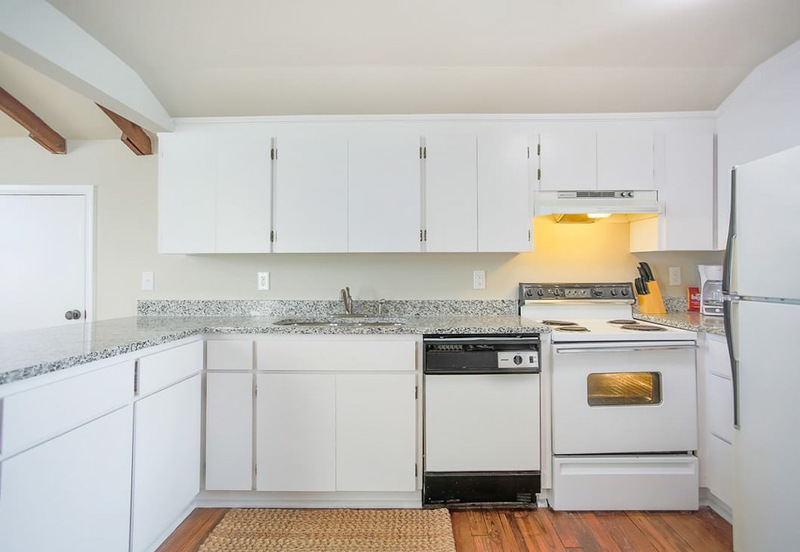 Excellent, quiet studio for two that is close to everything Savannah has to offer. We thought parking would be a challenge but we always found a space within a block. Hi Courtney! Thank you for choosing to book with Lucky Savannah. We're so glad to hear that Sparrow's Nest was a good fit, and look forward to hosting you again soon. First visit to Savannah was great! Our stay in Sparrow's Nest was great! It is in a great location, central to everything we wanted to do. Everything was accurately portrayed in the listing, everything was very clean and well maintained. The check in process with the app is super easy and convenient, no having to go to an office to get keys, etc. The only complaints I would have: 1) the mattress is extremely firm and not very comfortable. 2) There are no parking spots included with the property, so you need to find street parking or a parking garage. Not a huge deal since we mostly walked everywhere, but on the 1 or 2 occasions we took the car to drive somewhere it was a little bit of a pain. All in all a great experience, would definitely recommend! Kaitlin, thanks again for choosing Lucky Savannah! We're so glad to hear that you enjoyed your time at Sparrow's Nest, and look forward to hosting you again soon! 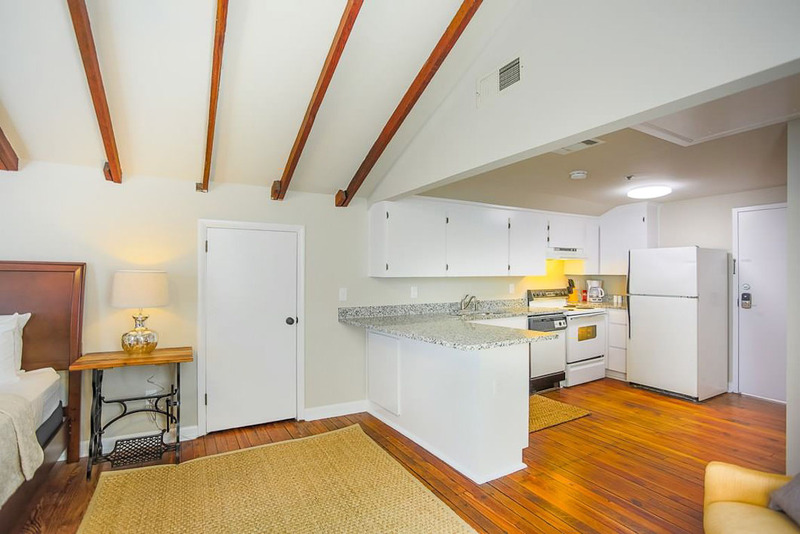 Great location, very clean and you can walk to pretty much anywhere in downtown Savannah (15 min to river street). Keith, thank you again for choosing Lucky Savannah! We look forward to hosting you again soon. 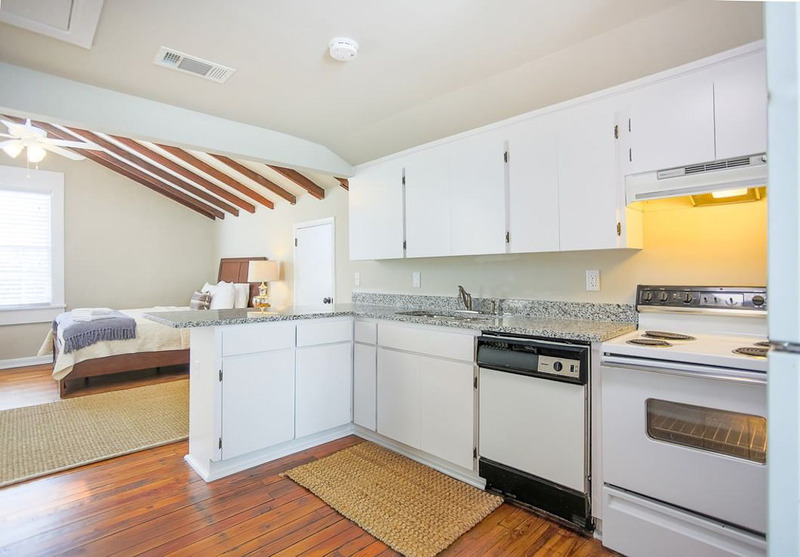 My wife and I rented this efficiency apartment located on Liberty Street in Savannah. It is on the third floor. Absolutely clean upon our arrival for a five day stay. Bed comfortable with nice linens. HDTV that worked great. Kitchen with all that you will need. The photos online were not misleading in any way. The bathroom is small. Walk in shower. A nice feature was the closet area. You can see the doorway leading to it between the bed and kitchen area. This allowed us to hang our clothes. This is an iron. Washer/dryer combo. We used only the dryer to have our towels nice and warm. We used the heat function for the apartment. No need for air as Savannah is a little colder this time of year. 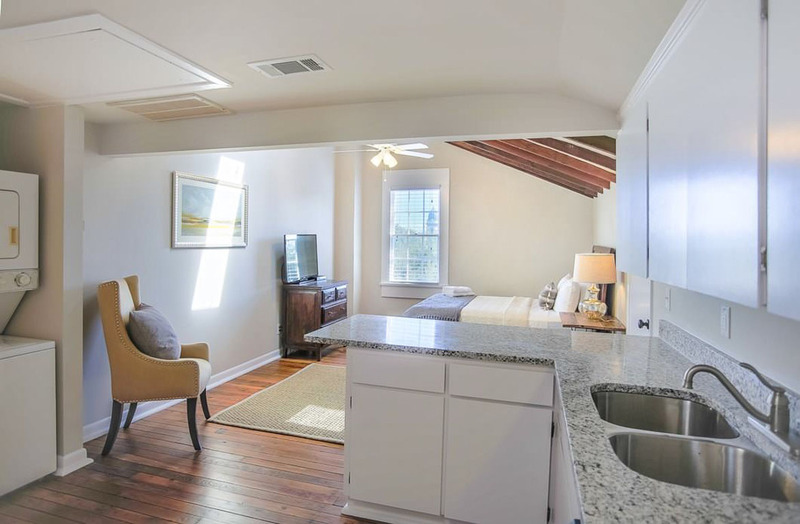 The location for this VRBO in Savannah cannot get any better. You are two blocks from Bull Street. This will lead you north to the City Market/Riverfront and south to Forsyth Park. Next door on Liberty is J Christopher's which has one of the best breakfasts in town. You are one block from the beautiful Cathedral. Just one block north is Parker's Market. A gas station/convenience store/gift store is a super stop. They have breakfast sandwiches, lunch sandwiches, salads and deli bar. There is beer and wine. A definite stop for a good inexpensive meal on the run. The entry to the apartment house is a key pad. A different combination key pad is outside the apartment. Both worked well the entire trip. If location and convenience is what you are after, this is a perfect apartment. Live like a local. Parking is always an issue in Savannah. 8-5 you need to feed the meters. At night it is free but watch the no parking certain nights for street sweeping. You can get a window pass that allows you to park at any meter for any length of time. Go to parking services and get a $14 dollar two day pass if you have a car. It's worth it. Weekends are free at meters. Enjoy your stay in this apartment. Thank you for choosing to stay with Lucky Savannah! We are pleased to hear you all had an amazing stay here in Savannah. We appreciate the honest review, and the accurate description of Sparrow's Nest and Savannah. Our team hopes to have you all again in the near future. Please don't forget about 10% "Returning Guest" discount! Sparrow's nest was a lovely place to land for my three-night stay in Savannah. Nice, clean, comfortable apartment with everything I needed. The only maintenance/repair issue was a broken marble threshold at the bathroom door. All the pieces were there, but if I stepped on it, they pieces would all fall of place. The Lucky Savannah app and portal worked well, but I never got the entry code for my apartment door. I happened to bump into someone on-site who knew the code, but if I hadn't, I would have been out of luck, so to speak. When I called the LS number, I got voicemail, and no one called back. Thank you for choosing to stay with Lucky Savannah! Sparrow's Nest is indeed a lovely place to spend three nights in Savannah. The apartment has a prime location, and is within walking distance to many great places! We apologize you were not provided your code. We try our hardest to make sure every guests stay goes as smoothly as possible, and we try our hardest to get back to our guests as soon as possible. We hope to have you all as our guests again. Please don't forget about our 10% "Returning" guest discount! 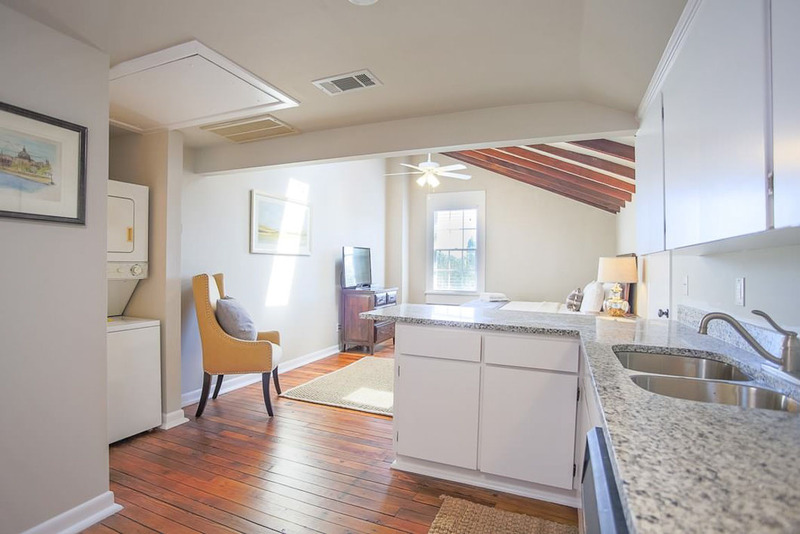 This is the cutest little studio apartment! Granted, I was only in the room to shower and sleep, but it met all my needs. The décor has a calm, country chic vibe to it, which made it much more inviting than a plain ol' hotel room. I really did not have any issues beyond check-in. I found the code to enter the building, but could not find the code to enter my apartment. I called Lucky Savannah and a customer service representative handled the issue. The whole phone call took less than 2 minutes. The location is ideal (to me) in that you're in downtown Savannah, in walking distance to river street, but far enough from the hustle and bustle to have some peace at night. During my extended weekend in Savannah, I toured the Cathedral of St. John the Baptist, the Mercer-Williams House, toured Bonaventure Cemetery, visited numerous coffee shops, and enjoyed restaurants like The Olde Pink House. I would highly recommend this apartment due to its location, in addition to the fact that I prefer a more authentic experience rather than staying at a chain hotel! Thank you for choosing to stay with Lucky Savannah! We are so glad to hear you all enjoyed the location, and convenience of this property. We try our hardest to ensure all of our guests a great stay, and a great home! 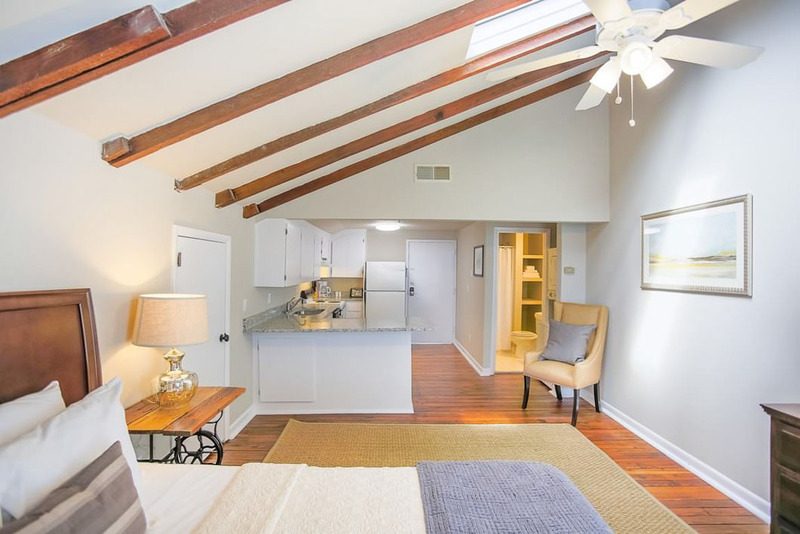 Sparrow's Nest is a great choice for someone who wants to just get away. We sure do hope to have you all as our guests again. Please don't forget about our 10% "Returning Guest" discount! The apartment was very clean when we arrived, and had all of the amenities that we could need. The pictures of the space were extremely accurate. The apartment is right above J Christopher's, which is a fantastic breakfast place. We were walking distance to anywhere we could possibly want to go in downtown, only a 15 minute walk to the river. I would definitely stay here again. We loved everything about this place except the stairs and there was a lot of them. Great location! I would stay here again. Thank you for choosing to stay with Lucky Savannah! This home is located on the top floor of the building, and we do communicate to our guests that there will be several flights of stairs to climb. This home is quaint, and cozy, with indeed a perfect location! We are glad to hear you all would like to stay again.